The blanket octopus, Tremoctopus violaceus | Marine Life Society of South Australia Inc.
Andrew Wright, General Manager for Calypso Star Charters, recently sent us some photos of what he thought was a blanket octopus that had swum into their shark viewing cage at the North Neptune Island marine park on Good Friday. It is most unusual that the octopus swam into the shark viewing cage where it was able to be photographed. It certainly seems to be a blanket octopus, Tremoctopus violaceus. 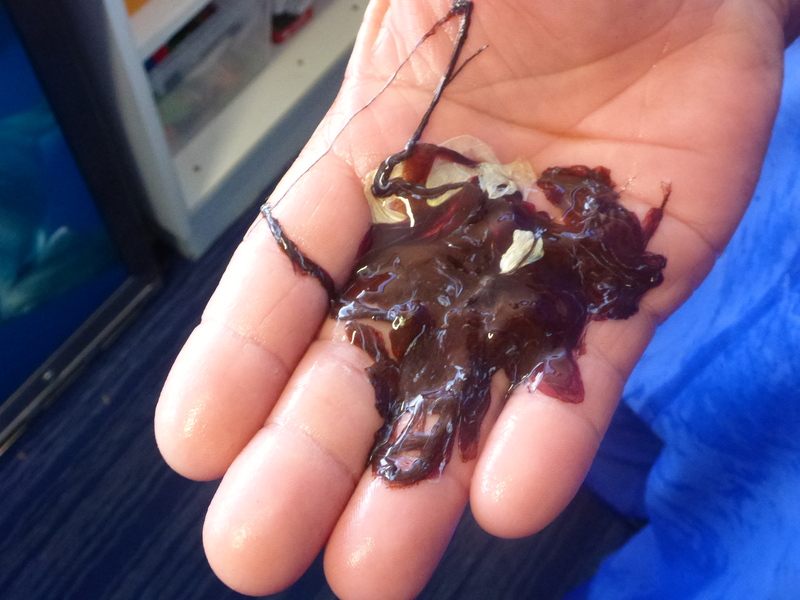 A sample of the ink squirted by the octopus was gathered and photographed. According to “A Guide to Squid, Cuttlefish and Octopuses of Australasia” by Mark Norman & Amanda Reid (mlssa No.1051), blanket octopus live in the open oceans of the world. The species belongs to the Family Tremoctopodidae. It is only the female blanket octopus that has long veil-like webs on the upper arms, resembling a blanket. These long, thin webs trail behind the female when she is ‘jetting’. Male blanket octopus are small in size and have no webs at all. The female reaches a length of about 2 metres, whereas males are only 5-10cm long. The book goes on to state, “The transparent webs of the front arms are segmented and can be shed like sheets of paper. The live animal has iridescent purple and gold spots within each web segment of unknown function.” The females are dark purple above and cream pink below. 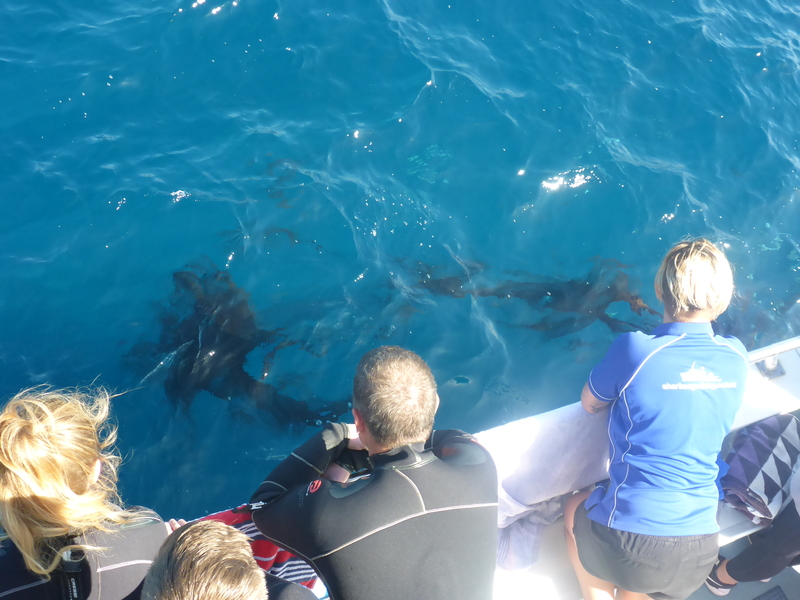 The one that swam into the shark viewing cage is clearly a female due to its colouration and size. Males store sperm in “a specially modified third right arm” which develops in a pouch. The arm has a bulb-like sperm reservoir on the tip. The arm severs and crawls into the mantle of the female during mating, after which the male dies. The eggs that the female carries are “attached in strings to a small secreted rod. Juvenile (female?) octopus have been found to arm themselves with the stinging tentacles of jellyfishes. Females have water pores on their dark upper surface. Our thanks go to Andrew Wright & Calypso Star Charters for sending us the octopus photographs and sharing their sighting with us. Exciting alright! Thanks for your ID confirmation.